This is the title my husband came up with after I had shown him the pictures for this post. He obviously wasn’t being serious but too much TV (him) and lack of blog post title ideas (me), well….. let us just stick with that. It might as well be since I seem to have a print-mixing, color-binge theme going on as of late. Not that this is different from my previous posts, as you’ve probably noticed, I wear a lot of color. and prints. and more color. These are my absolute favorite things to wear during the hot, summer months. They just seem to go with the mood that everybody seems to be in during this time of the year. 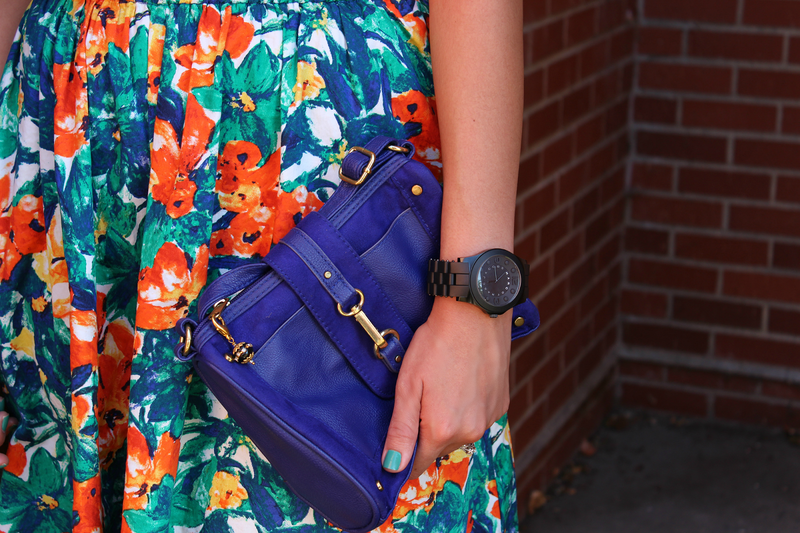 The colors on this ensemble is no exception. I had worn this to work and love how it is such a pick-me-up especially on humdrum work days. Wait…. Is this even orange? Lol! Definitely nothing wrong with color! You gotta rock what you're most confident in. Lovely look. That floral skirt is lovely. thanks girl! patuloy ang chikahan! Great mix of prints! Such a vibrant and beautiful outfit, Uris! This outfit is gorgeous and I love how you mixed these prints! That skirt is so pretty! I love this!! The mixing of patterns with the top and the lovely colors with your skirt looks amazing! I am really lovin those shoes though!! Oh my gosh, so cute! I love this outfit! The mix of prints is great and those shoes are so fab! Love the pattern mixing you did here! And those shoes are Ah-Mazing! Beautiful look. thank you Jennie! so sweet! 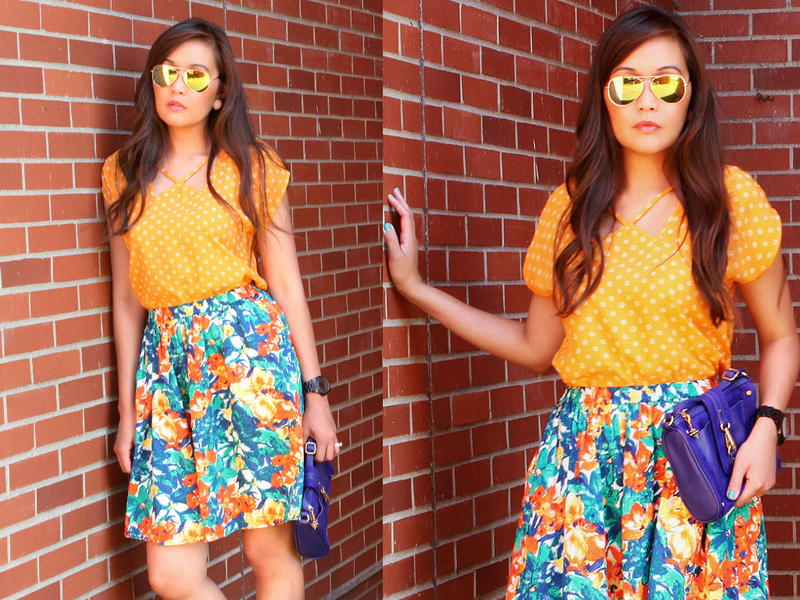 Love love this bright color combo, the perfect summer outfit! Stopping by from the link up. This outfit is fabulous! I love all the color. thank you so much Gabrielle, so sweet as always! I love how you mixed these prints, it's such a pretty look. I have a colour business and I'm always advising clients to wear colour and not black as it reflects onto the face and livens up the skin. We look healthier in colour, more radiant, fresher and younger. You look great in orange! yes, I agree! thanks Lorna! Wow, I love this outfit! It's so playful and feminine. The pattern and color combinations are excellent! This is a perfect outfit and totally my style. Two of my favourite prints looking even better when put together. The shoes are beautiful. Best outfit! LOVE the outfit. Your a master at mixing prints ;) Visiting from Funday Monday linkup! aaaaww thank you so much for the sweet compliment! Perfect mix of patterns! You look adorable. great pattern mixing!! love this outfit, it looks fab on you! found you via stylish tuesday. Loving this combo! Thanks for linking up last week! your pattern mixing is perfection! love! Nice said! Blog is nicely maintained. Fashion is moving on. To stay trendy, see yourself in tops and jeans! They really add a nice shape to your body.